Just two seasons ago, Bishop Carroll dominated Class 5A to win the school’s first football state title since 1978. Things are starting to feel very familiar. Carroll has rolled through six weeks by outscoring its opponents 325 to 44, and have many already comparing this year’s team to that of the 2012 Eagles. Only Carroll and Pittsburg remain unbeaten in Class 5A entering district play and neither probably feels like they’ve been tested enough. Pittsburg’s closest game came in a 66-36 win at Chanute back in Week 4. The Purple Dragons’ tests begin this week as they are part of the classification’s most challenging district. District 4 features Pittsburg and Eastern Kansas League members Blue Valley Southwest, Blue Valley West, and St. Thomas Aquinas. The general consensus is that the four best teams on the east side of the bracket reside in District 4, and that one of those four teams will ultimately advance to the 5A title game to take on Bishop Carroll. If that team is Pittsburg, the Purple Dragons would play the 5A title game in their hometown at Pittsburg State’s Carnie Smith Stadium. KC Schlagle (4-2) – The Stallions put up 60 points last week against KC Harmon (0-6) and have put up 32 points or more in three other games. Schlagle’s Cornelius Ruff leads the team with 566 yards rushing and eight touchdowns. KC Washington (4-2) – KC Washington has posted three shutouts in six games this season. The Wildcats enter district play on a two game winning streak beating both KC Harmon (0-6) and KC Sumner Academy (2-4) by a combined 94-0. Javeon Williams has rushed for 895 yards and seven touchdowns on the season. Lansing (2-4) – Lansing has played some good team tough this season despite its 2-4 record. They lost to class 4A-I No. 5 KC Piper (5-1) 20-14 in the opening week of the season and Bonner Springs (5-1) 27-13. Senior quarterback Krystian Abbott leads the way for the Lions, throwing for 817 yards and five touchdowns. Leavenworth (2-4) – Leavenworth has battled through a tough schedule so far this season playing multiple ranked teams in class 5A and 6A. As a team, the Pioneers have rushed for 844 yards and eight touchdowns. Quarterback Landry Hodges has passed for 621 yards and five scores. Isiah Ross is the Pioneers’ leading receiver with 18 receptions for 251 yards and two touchdowns. Shawnee Heights (2-4) – The T-Birds have only two victories, but that may be a bit misleading. Shawnee Heights has defeated a pair of quality Class 6A schools in Topeka High and Junction City. This past week, the T-Birds handed Topeka High its first loss of the season with a 28-21 overtime victory. Three of Heights’ four losses came by three points or fewer. Topeka Seaman (2-4) – The Vikings have suffered big losses to Topeka Hayden, Manhattan, Junction City and Topeka High. They enter with some momentum coming off a 35-20 win against Emporia. Seaman’s Joseph Reagan is one of the fastest players in the state as he is a six-time Class 5A sprint champion. Topeka Highland Park (1-5) – The Scots snapped a 10-game losing streak with a 60-26 win over KC Harmon in Week 2. Other than that, they have lost every game by 36 points or more. Topeka West (1-5) – The Chargers defeated KC Wyandotte 29-26 in Week 1. Since then, they have dropped five straight to Topeka High, Emporia, Washburn Rural, Manhattan, and Topeka Hayden. Topeka West has allowed at least 41 points in each of those games, while never scoring more than 7. Key Games: (Week 9) The Shawnee Heights and Topeka Seaman game will likely determine the district champ. Bonner Springs (5-1) – The Braves opened the season with a 35-27 loss to Eudora, but bounced back with five consecutive wins over Chanute, Basehor-Linwood, Lansing, KC Piper and Tonganoxie. Bonner Springs finished 6-3 a year ago but failed to make the playoffs. Quarterback Connor Byers has passed for more than 1,300 yards with 14 touchdowns and rushed for more than 500 yards and eight scores. St. James Academy (5-1) – The Thunder’s only loss came 21-0 to Missouri Class 4’s No. 2 ranked Helias Catholic. Quarterback Trey Keith has passed for 615 yards and 11 touchdowns. Jake Burgmeier leads St. James in rushing with 540 yards. The team is hoping to make the playoffs for the second straight season. KC Turner (3-3) – The Golden Bears have already exceeded their win total from a 2-7 season in 2013. However, they enter districts on a three-game losing streak. Quarterback Santino Bernal has passed for and rushed for more than 200 yards. Mill Valley (2-4) – The Jaguars’ record may be a little misleading. Their four losses were to St. Thomas Aquinas, Blue Valley Northwest, defending Class 6A state champion Derby and Missouri’s Staley. Mill Valley is coming off a 57-7 win over a Lansing team that defeated KC Turner the previous week. Logan Koch has rushed for 620 yards and seven touchdowns, while passing for nearly 500 yards and four scores. Pittsburg (6-0) – Pittsburg has moved all the way up to No. 2 in the class 5A rankings thanks to the play of senior running back Alex Barnes. Barnes has rushed for 1,240 yards and 20 touchdowns in the Dragons six games. The Purple Dragon defense gives up an average of just 9.5 point per game and has posted three shutouts in six weeks. The offense can score as well scoring 41 points or more in all six games this season. St. Thomas Aquinas (4-2) – Ranked No. 4 in class 5A, the Saints look to contend for the district and state championship in Randy Dreiling’s first season. Aquinas’ two losses have come against class 4A-I No. 1 Bishop Miege and class 6A No. 3 Blue Valley. In four of the six games, the Saints scored 34-plus points and average 31 points per game. Blue Valley Southwest (3-3) – Southwest started out hot going 3-0 and averaging just over 32 points per game. But three consecutive losses before districts have the Timberwolves at .500. Luke Wilmes leads the rushing attack with 393 yards and five touchdowns. Blue Valley West (3-3) – When the Jaguars win they score a lot, averaging just over 40 points per game. When they lose points are hard to come by, averaging just 9 points per game. Quarterback Zev Mallin has been out with an injury. West will try and rely on a young offensive line and a solid running back in Tyler Cox. Key Games: This district likely includes the top four teams on the eastern side of the bracket and four of the top ten in the entire 5A classification. All games will be key ad home field advantage may play a big part in deciding these match-ups. Andover (5-1) – The Trojans’ only loss came 42-10 to No. 3 Salina South. Andover earned tight wins over Andover Central and Arkansas City. Andover seeks its third consecutive trip to the playoffs after finishing 9-1 last year. Wichita Heights (5-1) – The Falcons, who are ranked No. 5 in the state, will look to make a run after dropping from Class 6A. Trenton Autry rushed for 125 yards during last week’s win against Wichita West. The Falcons’ only loss came to No. 1 Bishop Carroll. Kapaun Mt. Carmel (4-2) – The Crusaders enter districts on a three-game winning streak. Kapaun is led by dual-threat junior quarterback Brock Monty. Kapaun hopes to return to the playoffs after finishing 10-2 a year ago. Emporia (3-3) – The Spartans are coming off a 35-20 loss to Topeka Seaman. However, Emporia has notched wins over Washburn Rural, Topeka West and Shawnee Heights. 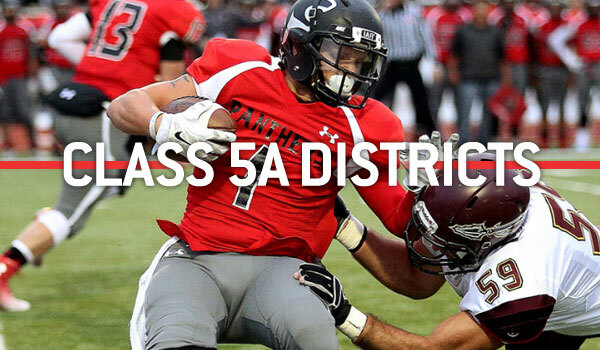 Emporia fell short of the playoffs in 2013. Key games: Every game is important in a wide-open district race. Salina South (5-1) – Salina South has retooled after it finished 10-3 and Class 5A runner-up in 2013. The Cougars, unranked in the preseason, have risen as high as No. 2 in the rankings. Salina South lost 45-14 against Derby last week after it started 5-0 with every victory but one by at least 29 points. The Cougars have averaged 241 rushing yards and 167 passing yards after it returned just 11 percent of their offensive yards. Quarterback Dalton Wassenberg has passed for 997 yards with a 14/3 TD/INT ratio. The Cougars have picked off 10 passes and are plus-eight in turnover margin. Salina Central (4-2) – After a surprising run to the second round of the playoffs last season, the Mustangs have already matched last year’s regular season win total. Salina Central started 0-2 with a pair of blowout losses, and then defeated Maize 29-28 in Week 3. Since then, the Mustangs have allowed just 27 collective points and won every contest by at least 15 points. Central is 4-7 in the last 10 years against its crosstown rivals and has lost the last three in a row. Great Bend (2-4) – The Panthers opened up with three losses, including a blowout Week 2 defeat against rival Hays High, but is 2-1 in the last three weeks with just a 28-21 loss at Dodge City. First-year coach Tony Crough has taken over for Bo Black, who is now at Hays High. Thomas Bobbitt leads the Panthers with 543 rushing yards. Newton (2-4) – Newton has lost three in a row, including a 42-41 overtime loss to Maize last week when the Eagles completed a 4th-and-25 pass for a touchdown in overtime. Bradley Million and Kade Remsberg lead the Railers in rushing with 534 and 460 yards, respectively. Bishop Carroll (6-0) – Carroll is the best team in Class 5A behind running back Denzel Goolsby, quarterback Colton Howell and the “Gang Green” defense. Carroll is No. 1 in Class 5A in scoring offense (325 points) and defense (44 points allowed). Last week, the Eagles clinched a third straight league crown. Maize South (5-1) – Maize South has put together another strong season and has won four straight, including a 28-25 victory against Coweta (Okla.) last week. Maize South is now 22-5 since the start of the 2012 season. The Mavericks tied for No. 1 in scoring defense in Class 4A last season and rank fifth this season with 89 points permitted. Maize (4-2) – Maize has arguably played Kansas’ most thrilling schedule. The Eagles defeated Derby 20-13 in a great Week 1 contest, and then lost 29-28 at Salina Central in Week 3. After a 49-30 victory in Week 4, Maize lost 40-37 in overtime versus Hutchinson in Week 5, and won 42-41 in overtime against Newton last Friday. Maize quarterback Connor Lungwitz is one of Kansas’ top players and completed a 4th-and-25 for an overtime TD last Friday to beat Newton. Maize is No. 4 in Class 5A in scoring offense with 229 points, but has allowed 190 points. Valley Center (2-4) – Valley Center was winless in 2013, but defeated Arkansas City, 13-12, in Week 2, the Hornets’ first victory since Week 6 of the 2012 season. Valley Center has narrow losses to Newton (26-21), Goddard (10-7) and defeated Goddard-Eisenhower 34-14 last week. Arkansas City (2-4) – Arkansas City defeated Winfield 34-13 in Week 1, and then dropped two games by a combined four points. After a 32-16 victory versus Newton in Week 4, the Bulldogs have lost big to Maize South and Pittsburg. Arkansas City was expected to have an improved defense this season and has allowed just 23.5 points per contest after it permitted 29 last year. Goddard (2-4) – Goddard has had trouble scoring points, but has matched last season’s win total with a 30-10 Week 2 at Clearwater and a 10-7 victory at Valley Center in Week 5. The Lions have lost all four games by at least 18 points. Goddard Eisenhower (1-5) – The Tigers’ lone win is a 38-35 Week 5 home victory against Andover Central. Other than the victory, Eisenhower has not scored more than 15 points in any contest. Liberal (1-5) – Liberal had one of Kansas’ top offenses behind quarterback Britton Abbott and wide receiver Trenton Hammond last season and lost to Kapaun Mt. Carmel 55-40 in the first round of the playoffs. But the Redskins have fallen back considerably with first-year head coach Caleb Cline, a former assistant. The Redskins’ lone victory was a 41-6 Week 2 win against Guymon, Okla. Quarterback Jared Hasik has thrown for 391 yards with five scores against one interception. Rex Heronemus paces the Redskins with 538 yards. Key Games: All games will be key in a district where every team has struggled for consistency.